I don’t have room for all my books. We moved here eleven years ago and I still have boxes and boxes of books in the cellar. Even though building bookshelves ought to take some kind of priority, we went for an indoor bathroom first, and then windows, that kind of thing. So instead I have piles of books distributed about the house in odd corners, a bit like Tetris. But you need to leave room to walk around, and places to put down a cup of tea. One of the great things about doing this piece was that I went down into the cellar to have a look in the boxes. I thought I might find my old copy of The Life of Pi (I didn’t). Mostly down there I keep books that visitors might like to read, but which I never will again, as well as travel books, old economics and business books, the 1996 Writers & Artists Handbook, that kind of thing. I’m obliged to keep a lot of good novels down there too though. Occasionally I make a foray into the cobwebs, and fish out some different ones for the shelves, putting others away for a while, but it happens very rarely. Not really no, apart from my TBR pile, which grows all sinister and precarious, on my bedstead. I tend to keep books I think might most interest other people in our sitting room, where they can be grabbed easily. Every now and then I move things around. I think you stop seeing things when they stay the same way too long, which is why sometimes you go mooching round other people’s shelves and go “Oooh! Louis de Bernière, I haven’t read that him ages,” despite having several on your own shelves. They look different and more appealing out of context. So I’m a shelf fidgeter. It was probably one of Walter Farley’s Black Stallion books, if pocket money counts. Otherwise a Jilly Cooper book in my teens with money I earned myself. Probably Riders. Jilly Coopers are boxed. The children’s ones have resurfaced, including a huge stack of faded well-leafed famous five books. Not really. My books are like me, what you see is what you get. Although now my children are reading, and often help themselves to books off my shelves – they are particularly interested in Nelson Mandela’s autobiography for some reason – I do need to move a few age-inappropriate books off the accessible shelves. I have things that people might want an explanation for, like Mein Kampf. But some books you don’t read for pleasure, but to try and comprehend something incomprehensible. Do you know, I love having books, and I have so many treasured books. We have a first edition 1927 A.A. Milne NOW WE ARE SIX , which was given to my husband’s granny when she was little, as well as some Rudyard Kipling books from the same era. They’re magical. And books that my husband and I annotated as kids. Books with messages written in from friends many years ago. Collections of poetry I read and re-read and memorised as a student. It’s the personal element that makes them special. But if there was a fire they could burn, to be honest. I’m not desperately attached to things, it’s the stories that go on. My parents only had on small book shelf, belonging to my father. My mother had no books (since her divorce she has since become a voracious reader). The shelf had Readers Digest hardbacks on it – the entire collection of Charles Dickens and a family health book – and an atlas. That was it. I devoured the health book and the atlas as soon as I was old enough to read, which made me a bit precocious…but I never did read the Dickens. I inherited them though, and they’re now in a box in the cellar. Normally if I borrow a copy, I’ll only buy it if it’s one I want to read or refer to again. It’s more likely I would buy a copy as a gift for someone else and buy other books by the same author for myself. We’ve just had Christmas and my birthday, so I’ve a big pile of new books off my wish-list. They include Canada, Rook, To the Lighthouse and The Great Gatsby, which I’ve never read. I know I have also been given a copy of Maggie O’Farrell’s new novel Instructions for a Heatwave via pre-order, and even though it’s not in my hands yet, it’s there in spirit. My hardback of Vanessa Gebbie’s Coward’s Tale, which I loaned to someone and don’t think I’ll ever get back now. Otherwise no, although I do have a big wish-list for the 2013 crop coming up. I’ll buy things when I know I’ll have a chance to read them. It would depend where they look. I’ve kept books for over 30 years, so there’s quite an evolution there. They all mean something to me, they say something about a certain era in my life, I can remember where I was when I read most of them for the first time. I think my oldest friends can see that too. But for others? It probably looks like a confusing and erratic collection. 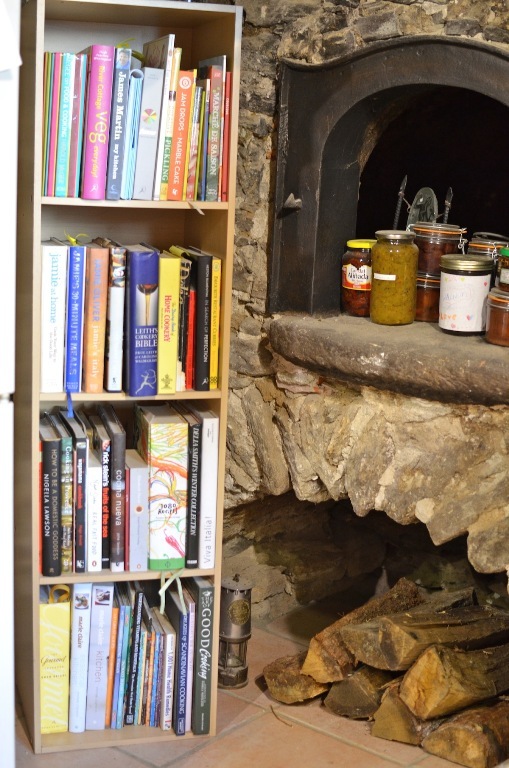 Being in the South of France we do get a lot of visitors, and I hope when people stay and ask to borrow a certain kind of book, I can find them something to their taste. I hope there’s something for everybody. A big thank you to Claire for letting me grill her and sharing her shelves with us all. 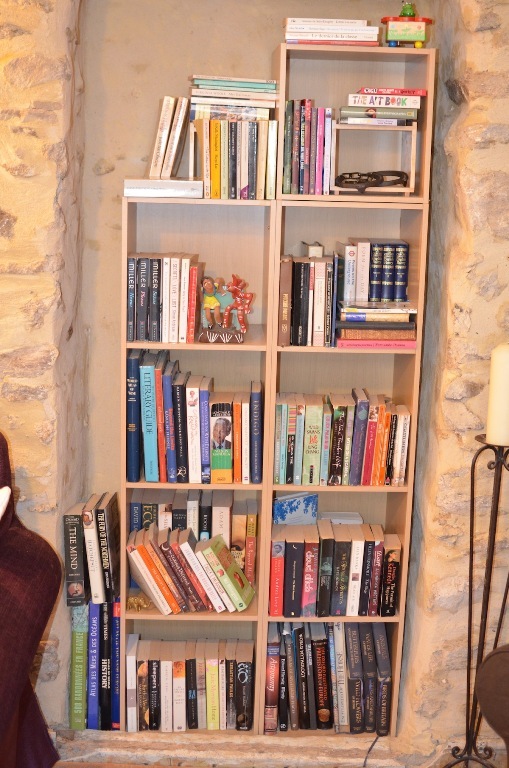 Don’t forgot if you would like to participate (and I would love you to) in Other People’s Book Shelves series then drop me an email to savidgereads@gmail.com with the subject Other People’s Bookshelves, thanks in advance. In the meantime… what do you think of Claire’s responses and/or any of the books she mentioned? 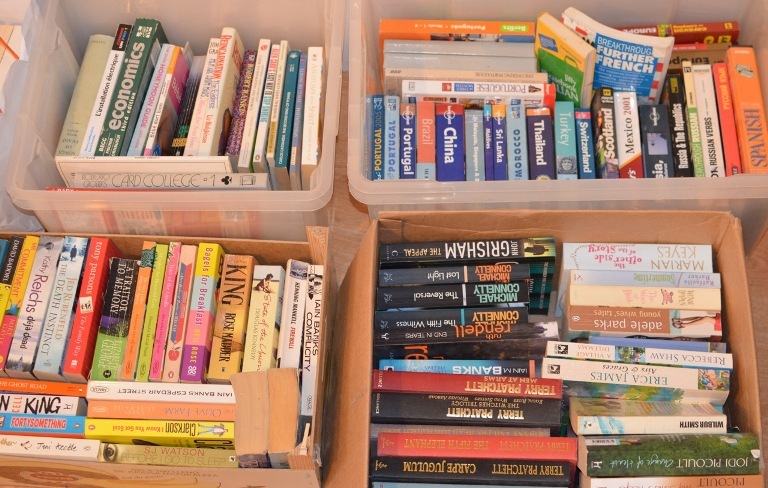 Oh this is beautiful ; at last someone with the same problems we have, although our boxing of books is happening in reverse–whenever we run out of shelf space my husband shuffles and shuffles the books around and then ends up with another box or two in the garage. I have to be hawk-eyed to prevent these being filled with my books. Brilliant!! I have no idea who Claire King is, but I feel like I’ve just read an interview with a soulmate! Not only regarding the “systematic book sorting” (not! 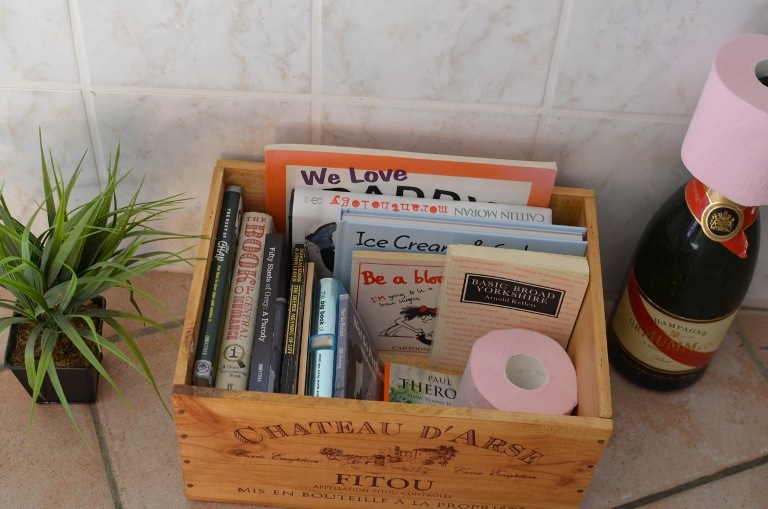 ), or the actual taste in books (even from a distance I recognised a lot of the spines as something on my own book shelves) but also the toilet humour. Love. Please tell me where I can order a crate of Château d’Arse. Just brilliant! Of course we haven’t got tired of the series! Great to see Gould on the pile and some Nigella too. I’d have no problem finding lots of interesting things to read here. I wonder if she has any Colette? Oh, yes, I can relate to the box dilemma! Please don’t discontinue the series – we all like to peek at other people’s bookshelves. And congratulations to Claire on the launch of her first novel! Great interview. We haven’t needed the loft yet, but I can see it on the horizon. Thank you for having me, Simon. Funny story, the night after I wrote this we had friends round for dinner and I was telling them about the article and not finding Life of Pi. “Oh, we have your copy,” they said, “you leant it to us about 10 years ago.” So that’s good! The chateau d’Arse is a red wine from Fitou. Very good too.